Visual Geekdom, Chapter 99: I love wooden puzzles of the sort designed and manufactured by Playskool and Sifo during the middle decades of the 20th century. My friend and colleagueLinda Solovic tracked this one down for me as a 50th birthday present late last year. Linda has a nose for these things, and a sure sense of my taste, closely related to hers, but heavier on boy items, like vehicles. I love this thing: the color, the beautifully controlled value progression, the play of edge and line, the chunky but self-aware drawing. The Playskool garage puzzle suggests a relationship with one of my heroes, the redoubtable Stuart Davis. 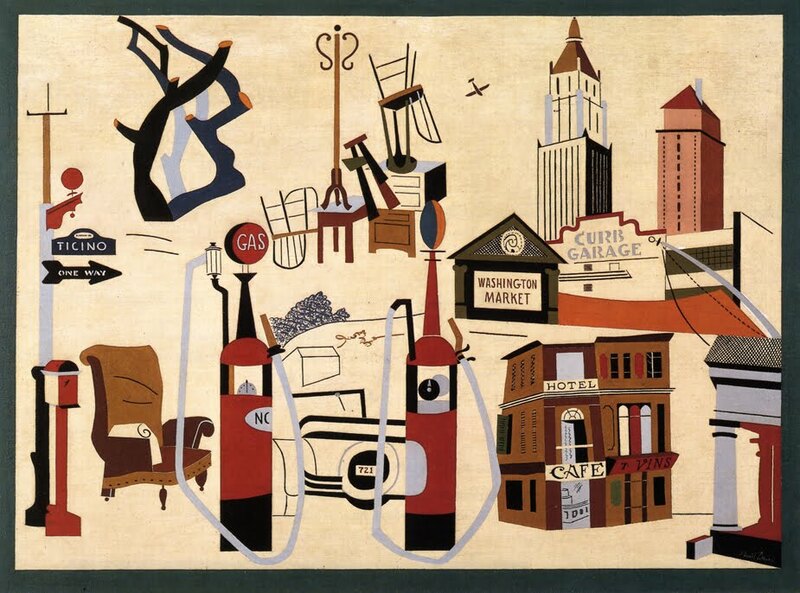 I am thinking of the edge/line investigation especially, but the puzzle also puts me in mind of the painter's seeming fixation with gasoline pumps in many of his works from the 1930s. New York–Paris No.3 (1931) provides an example. Squatter, to be sure, but the glass globes (the round things that say "gas") are emphasized. Here's an example of a milk-glass globe from an estate in Oklahoma. Anyway, I love my Playskool puzzle. Thanks, Linda!